What will this camp include? 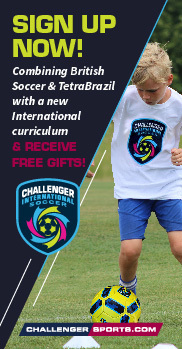 Challenger Sports began as British Soccer Camps in 1985 with 200 children; in 2005 we coached 65,000 children in 1500 camps nationwide. 2012 is Challenger's 8th year running camps at TSC and we are proud to have been selected to provide a venue for their camps year after year. All of our staff come from the United Kingdom and are a minimum of a UEFA ‘C’ Licensed coach. The UEFA ‘C’ License is equivalent to the USSF ‘B’ License. · Personally assessed by our Full-Time U.K staff. · Has a Visa from the U.S Embassy. · Has a full Criminal Background check. · Attends two, weekend long training and assessment days before they are offered a position. Multi-level curriculum developed by our full-time U.K staff. Each program we run has a desired outcome and is run to ensure that every player develops in at least one aspect of their game, whether as an individual or within the team dynamic.